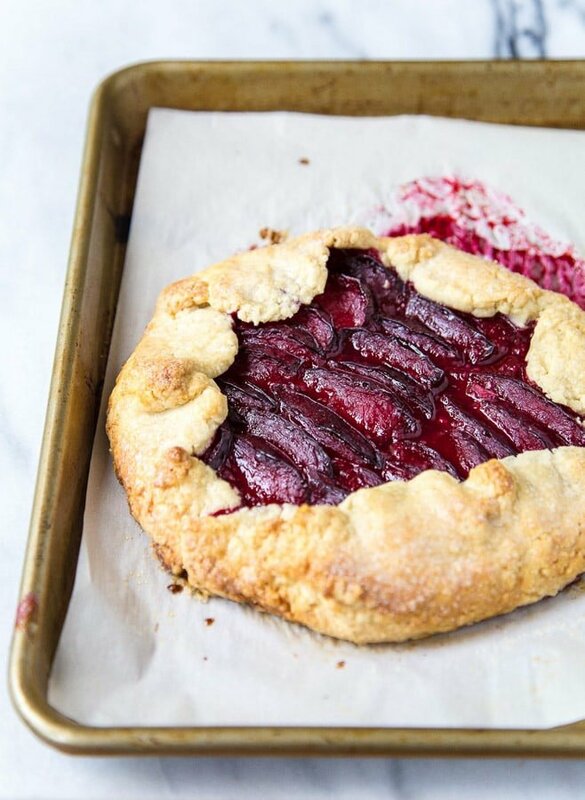 Plum tart for two with creamy almond filling. Do you guys remember when I stopped by the Martha Stewart headquarters back in January to do some promotional work for my cookbook? Do you? It’s basically all I think about. Still. I stare at the photo of my rotund (read: preggo) self in the lobby almost daily. Call me crazy, but I just want to keep reliving the best day of my life over and over. My Mom and I poured over all of Martha Stewart’s cookbooks while I was growing up. We watched her shows. We read her magazines. We have always been (and still are) Martha-obsessed. So, when Martha Stewart Living asked if I wanted to collaborate again, I screamed YESSSSSS like a kid on Christmas morning! I’m going to be cooking my way through her book Pies and Tarts, and scaling the recipes down for two. Is this my real life? What exactly do I do for a living? Can you go to college for this? After drooling over all the recipes, I had a hard time choosing which recipe to start with. If you have any requests, please leave me a comment below and I’ll get to work! 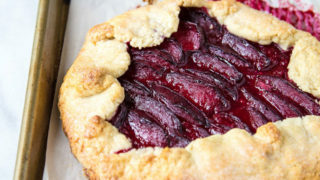 I ultimately chose this plum tart because plums are one of my favorite things about summertime. See, I actually love prunes (gasp! ), and I eat them all year long. So, when fresh plums come into season, I put down the dried ones and gobble up as many fresh ones as I can. I’m partial to the black ones with ruby flesh. I mean, who wouldn’t want to eat a crimson plum? I believe these are called Satsuma plums, but correct me if I’m wrong. The tart dough is a half-recipe for pate brisee is simple to pull together, promise. It’s all-butter richness is exactly what plums love. While it’s hard to tell from the photos, there’s a secret filling underneath the plums. I finely ground almonds with sugar and flour to tuck beneath the fruit before baking. As the fruit bakes, the almond mixture mingles with the fruit juices and makes its own custard-like filling. It’s one of those small, almost effortless steps that elevates your dessert to something oh so fancy. I always take a deep breath and hold it when I slide a pie into the oven. Pulse flour, salt, and sugar in a food processor (or whisk together by hand in a bowl). Add butter and pulse (or quickly cut in with a pastry blender or your fingertips) until mixture resembles coarse meal, with some larger pieces remaining. Drizzle 2 tablespoons water over mixture. Pulse (or mix with a fork) until mixture just begins to hold together. If dough is too dry, add 2 tablespoons more water, 1 tablespoon at a time, and pulse (or mix with a fork). Preheat oven to 350 degrees F. On a lightly floured piece of parchment paper, roll out dough into an approixmate 8-inch oval, 1/4 inch thick. Transfer dough (on parchment) to a baking sheet. Pulse almonds, 3 tablespoons sugar, and the flour in a food processor until ground to a coarse meal. Sprinkle almond mixture over dough. 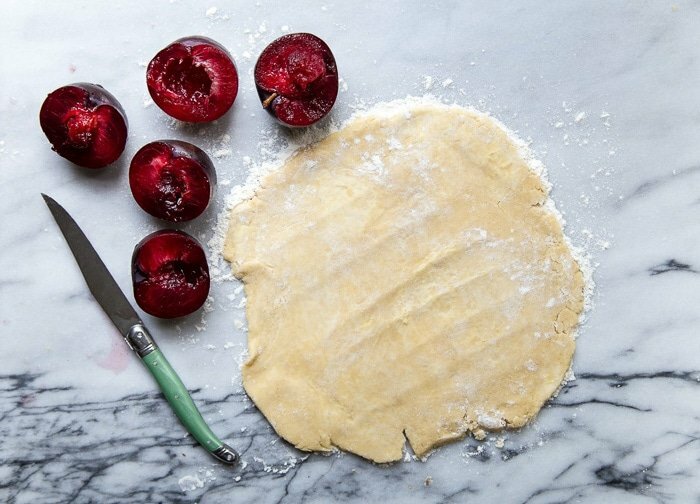 With a spatula, transfer plum slices to dough, spacing close together and leaving a 2-inch border; press lightly to fan out. Fold edge of dough over fruit. Refrigerate 30 minutes. Brush dough with cream; sprinkle galette evenly with remaining 1 tablespoon of sugar. 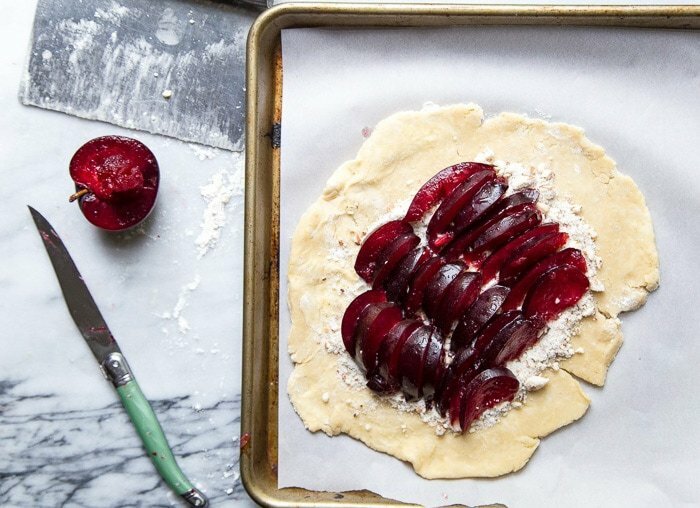 Bake until crust is deep godlen, and plums are juicy and bubbling, about 40 minutes. Transfer to a wire rack, and let cool completely. Yes, Please! I could eat them all! Getting to go to the Martha Stewart headquarters is so awesome!! I loved hearing about that and would totally want to relive it too!!! I need this tart! SO excited about this project! And plums do not get enough love. So fun seeing them highlighted here! This tart looks wonderful! Pinning! Yummy!! This looks oh so good!! I’m SO EXCITED FOR THIS. Oh my goodness it’s going to be great! 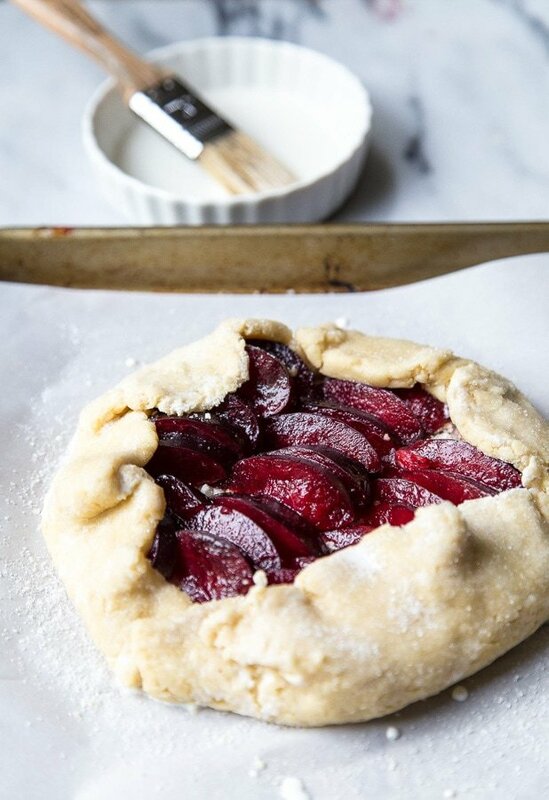 Great way to start out the baking journey with this plum tart. Yeee! Yes, please….ANY and ALL pies and tarts. I eat pounds of fresh fruits every week. Berries and stone fruits, well, I can’t get enough. Some yummies could include: coconut cream pie, lemon meringue, chocolate-caramel tart, fresh fruit tart with pastry cream or custard layer, and chicken pot pie. At Apple Hill I’ve purchased a caramel apple streusel pie as well as a sour cream apple or blackberry pie. Have never seen recipes for either type. For the effort, I wouldn’t mind a recipe that makes two smaller pies as it’s always great to have one in the freezer ready to bake. Congrats on collaborating with MS. What a dream come true. Thanks for listening to our input. Do you think the 15 min puff pastry would work here? Your life is ridiculous. But I’m so glad it’s happening to such a genuine, talented, and friendly person! Cheers to you and Martha!! What an amazing partnership! Congrats Christina! This Plum Tart is perfection and I love the secret almond mixture!! I could eat prunes all day long, too! 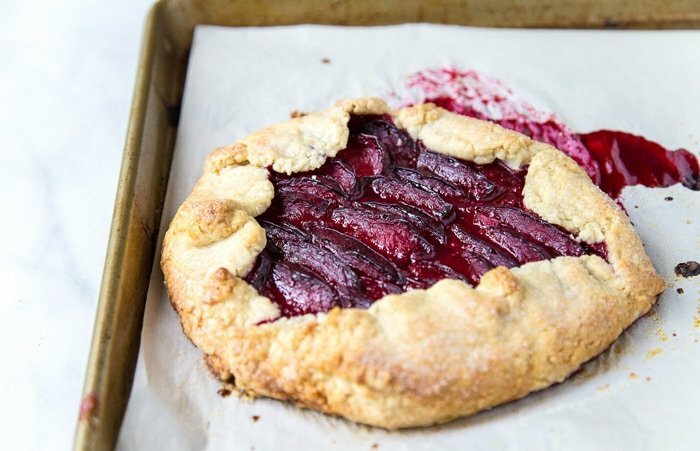 This plum tart looks amazing; I don’t blame you for holding your breath when you slide it into the oven: it’s perfection! Seriously, great job with this recipe! I’m loving everything about it! The instructions were super easy and everything came together like a dream! I made two to serve 7 people and had a few slices leftover. Yes, I was confused about that, too! I only make one from the recipe. I just made this again and I have to say, I loved it even more! This time I used a combination of plums and plumcots and I left my pate brisee in the fridge for about 24 hrs. I also added more almonds and got them a little too toasty, but it turned out delicious! Easiest recipe, just need patience with the pate brisee because you’re going to want to eat this right away! Yay, Genny! Now I’m craving this too! I just made this yesterday and had to run out of the house. I woke up this morning to the most beautiful and delicious treat to have with my coffee. It’s amazing! It made me feel like a pastry chef for the first time in my life and it was so easy. I used salted butter in the crust because it was all I had, so I thought I ruined it from the beginning. But the combination of the almond mixture and the sugar in top even the whole thing out. I’m very impressed. Thank you! Please excuse the typos. I have plum all over my fingers.